As far as I can tell, there is no way to actually find this source at Findmypast, besides locating it in the titles list. It does not appear to be indexed in any way. It’s possible I’m missing something obvious, of course. The locations do seem to be indexed, though, and within each location, you can page through the alphabetized list of names. 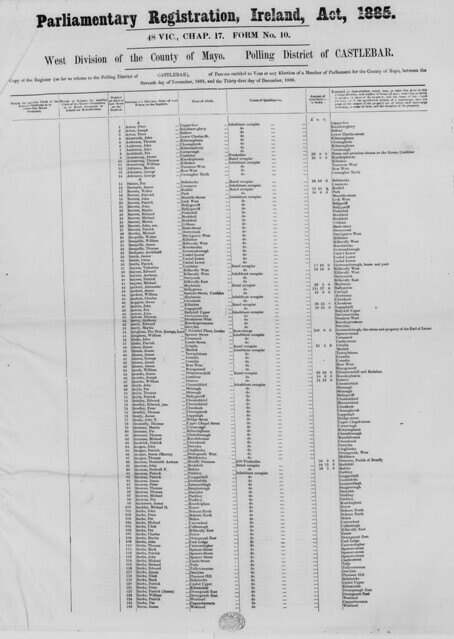 Great-great grandfather Walter can be found in the Castlebar register, on line 29. And look! His name is spelled here with an -e. His father, Michael, died in 1884, so he won’t be found in the 1885 electoral register.